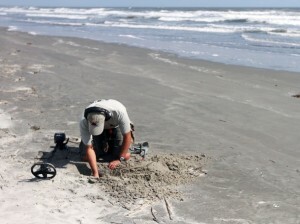 How deep will my metal detector reach ? What target depth will my metal detector reach ? This question ALMOST has no answer as it is really incomplete. What is the target sought, what level of trash elimination is to be used are headphones being used ? It is almost as easy to tell why a target cannot be located. One however can be reasonably assured to find a single US coin to a depth of 8 to 10 inches. Some operators with practice and experience will achieve greater depths of discovery others will achieve less. In this range of discovery and using the factory coin hunting setting, smaller items and coins such as dimes and pennies may be located more shallow while quarters and half dollars my be deeper. Operating in the All-Metal mode (no trash elimination) one may expect to achieve greater depths, again depending upon the size of the target. Nope, you will not find a single coin at 18 inches but perhaps quart can or jar of old silver coins will be located. With optional search coils for your detector, depths approaching 15 to 20 feet might be obtained. one really must be serious to do much more than just dream of targets in this range. Before you commit, do your research and contact the factory or your local dealer for specific equipment needs and operating tips and techniques. Remember many factors dictate depth, but the main ones are size of target, size of coil, soil mineralization, and target conductivity.